Eating a delicious pizza safely at a restaurant seemed like a long-lost dream not too long ago. 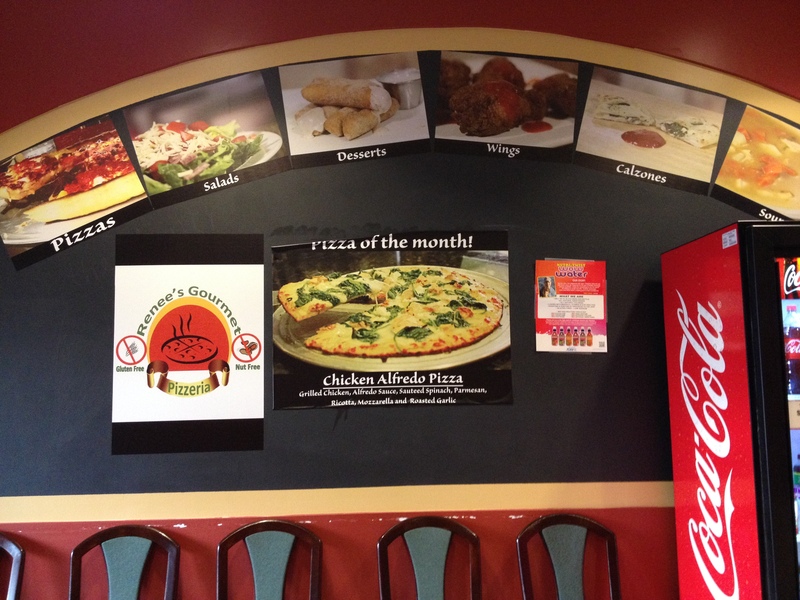 Then Renee’s, an all gluten-free and nut-free pizzeria, opened its doors near my house. Now I can enjoy really good pizza without the risk of cross-contamination whenever I have a craving. This is not the first time I have written about Renee’s Gourmet Pizzeria, and it probably will not be the last. Since it opened last year, the family-run pizza place has become a god-send for those with celiac disease and severe gluten and nut allergies. As I mentioned, Renee’s is entirely gluten- and nut-free. In fact, there are signs on the windows and doors prohibiting customers from bringing items containing those ingredients into the restaurant to ensure a safe environment for even those with airborne allergies. Most places that serve pizza and claim to have gluten-free and vegan pizza cook their pizzas in the same oven or make them in the same area as the gluten-containing pizzas. So, the risk of cross-contamination is quite high. Therefore, for the longest time, I feared I would never be able to eat pizza out with friends again. Then Renee’s happened. The pizza joint was started by a man whose daughter has celiac disease and a severe nut allergy. After watching his daughter get sick time and time again eating out at restaurants, he decided to take matters into his own hands and open a place where his daughter, and those who suffer similar conditions, could eat without fear. It took nearly a year, but he finely perfected a great rice-blend pizza dough recipe and Renee’s namesake menu item was born. But Renee’s, located 20 minutes north of Detroit in Troy, Mich., serves more than pizza. 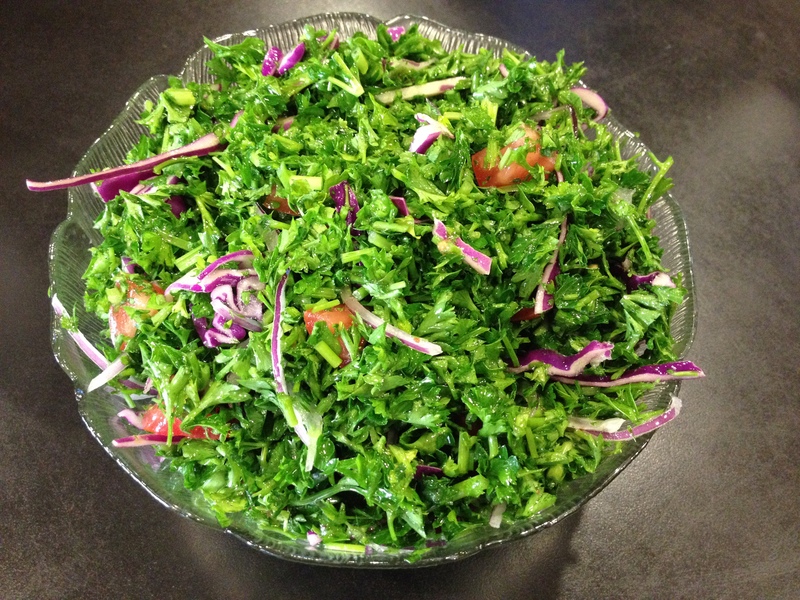 It has a full menu from featuring generously portioned salads, calzones and flatbreads. All of which can be vegan. If you are taking non-vegans there, they also have soups, including a homemade Hungarian goulash, freshly-made desserts and even chicken tenders and french fries, a rarity in the gluten-free world. Renee’s slogan is “I can’t believe it’s gluten-free!”, and I almost can’t. I’ve taken many friends and family members there and they all agree that it’s not just good, gluten-free food… it’s just really good. On my last trip, my friend’s boyfriend said it was one of the best pizzas he’s ever had. They split the deep-dish meat-lovers, which as the name suggests, is full of different meat. He also loved the tabbouli salad made of parsley, cabbage, tomato and onion mixed with a lemon-olive oil dressing, despite it not having the bulgar wheat the traditional recipe contains. My favorite is, unsurprisingly, the veggie lovers pizza. 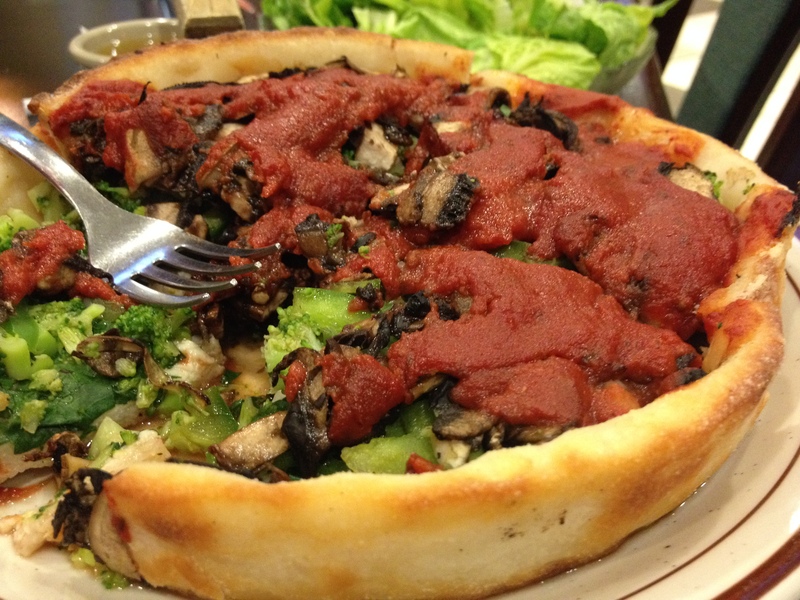 It’s loaded with spinach, onion, portobello mushroom, green pepper, and broccoli with a tasty tomato sauce. I usually order it without cheese, but they have Teese gluten-free and vegan cheese it you want. All of their pizzas are available as either a New York thin style or Chicago deep dish. It depends on your preference, but I love the deep dish. The crust is thicker and actually crunches when you bite into it. I ask for extra sauce and cut off the crunchiest ends and dip it into the sauce because it’s so good. Unlike some pizza places, Renee’s doesn’t skimp on the toppings either. The prices are a little on the high end for pizza, the 12-inch thin crust and 8-inch deep dish are $14.99 for the specialty pizzas. But, for me at least, I can only eat half an 8-inch deep dish when paired with a salad. Then I take the other half home for another day. Not only is the food safe and delicious, the staff is super friendly and helpful. They will customize anything to your specifications. If you are anywhere near metro Detroit, you have to check out Renee’s. The peace of mind of being able to eat pizza safely without risking cross-contamination is amazing. I can’t say enough good things about it. I can eat PIZZA again! I know this is a little late, but we had the Italian deep dish pizza. And it was delicious!!! And your post is lovely and I’m so glad the pictures turned out well!